Very nice all around whisky. The palate follows the nose. The sherry cask maturation gives a lot to this dram. Sherry, fruits and subtle sweetness. with light chocolate notes. 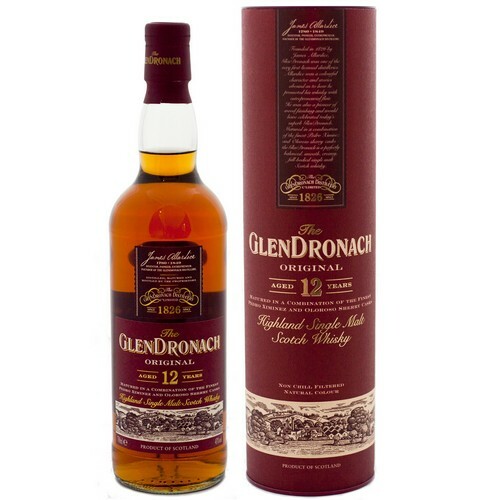 GlenDronach is one of the best when it comes to Sherried Whiskies. It is fairly priced and if you have any love for Sherry whiskies, you need to get this one. Strong, smooth and spicy. Some earthiness and wood, no smoke and not sweet. One of the best whisky. Nice. Malty, sweet, some honey, strong & smooth. initial nose is slight allspice, ginger, sourfruit candy, taste, honey, vanilla, apple, pear, slight bite and a fairly dry finish. heavy sherry, wine, raisins, sheep's furr (sic). wood, raisins in the taste, then spice, long dry finish with bitter wood, marzipan, nuts. Volle smaak. Je ruikt en proeft sherry. Mooie whisky. Dominant Sherry flavor. Great sweet aftertaste. zacht zoet met tofee en noten. hinting at the depth of the 18-year, but is a bit chemical for my taste. Ik kan er kort over zijn: geweldig!! En neus van donker, sappig fruit, toffee, rozijnen en iets als een nat herfst bos. De smaak is zoet, kruidig, fruitig, sherry en vol. En droog mondgevoel en een bittertje als van cacao tot slot. Wauw ! Ik kan er kort over zijn: geweldig!! En neus van donker, sappig fruit, toffee, rozijnen en iets als een nat herfst bos. De smaak is zoet, fruitig, sherry en vol. En droog mondgevoel en een bittertje als van cacao tot slot. Wauw ! Hotter up front than I expected at 43% ABV. palette and nose match up in regards to the fruit. some sour fruit notes mid and late palette. tofee and hint of vanilla. touch of oak. pleasant. slightly sour notes but not unpleasant. fruit and sherry, did not do it justice my first try..had it after Lagavulin. Will need to try again on its own. This certainly is a sherry monster; packed full of dried fruits, golden syrup and spice. My favorite sherry matured 12 year old whisky. 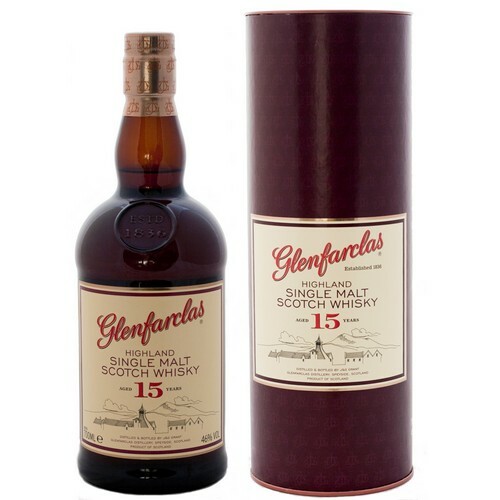 Matured in a combination of PX & oloroso sherry amazing value for money sweet and fruity on the palate nose floral notes the finish is medium smooth and sweet this is a must try whisky especially at this price range. Wärmend und an Fruchtmarmelade erinnernd. Etwas für die kalten Tage. Not overwhelming, but very nicely balanced. Lovely warming fruits over an oak character. Very smooth drink without sacrificing the full body. Rich fruits, citrus, mulled wine spices. Creamy, smooth, rich oak, soft fruits & sherry sweetness. Dry finish. Warmth is present from mid-palate and slowly diminishes. At last, the long awaited tasting of my Glendronach 12Y (bottled 2013) which is actually 18Y because of the 6Y distillery closing. This dark amber 43% Speysider spent it's years on a combination of PX en Oloroso wood. It is unfiltered and uncoloured. After pouring, sweet dark sherry fruit raises from my (with long legs covered) glass. Raisin, prune, blackberry and vanilla lead out but ginger, hazelnut and bakery oven complete this wonderful nosing. Harsh and hefty sherry oak on the palate at first zip. It feels a lot stronger than the 43% at this point. But with every following zip, the palate improves. Until it all ends in a soft sweet and creamy coffee, caramel and spicy fruit. Nice improvement of the hefty start. The medium sweet warm teethcovering finish, offers heavy dark sherry and dry spicy oak along with a nutty toffee. Very nice and the best part of the tasting. Powerful tasteful and balanced I would call this one. I didn't have this 12Y without the 6Y bonus, so I have to guess that this bonus one became heavier, oakier and darker with every bonus year duh. I liked this one very much. It's a heavy sherrie bomb that comes very close to the Allardice. I have to rate this with at least 92 points. Go get yourself one of this bonus year bottlings. Lovely whisky to relax with. Tastes like walking through a cherry orchard. Sweet sherry, orange fruit, and vanilla on the nose. Very enticing beginning which doesn't disappoint on the taste. Rich and creamy with fruit and honey on the palate. Silky smooth finish with a slightly nutty and slightly bitter orange aftertaste. Really engaging for a 12 year old. this is my defining meaty, sherried scotch. full bodied, richly sweet, it tastes of ripe red fruits. Very good for the price. I liked the rich smell of nuts. Didn't like wet ashes in the finish. I had a very good approach with this whisky. Rich and fruity nose and quite comes sweet taste. While going deep into it, it revealed a bit flat, especially for the sweet sherry notes. Not bad at all, but you can find something better for a similar price. Wow! What a strong nose of fresh oranges, or orange zest. Remind me a bit of La Copa vermouth. Sweet and smooth on the tongue followed by a bit of spiciness. Still some orange zest. Longer finish than I was expecting. The only place I notice a hint of smoke is in the finish. I'm impressed. heerlijke volle whisky met een hele volle afdronk. zeer de moeite waard!! lekkere whisky​ niet te zoet. Very, very nice! Pricier than I like, but you get what you pay for with this Highlander. Complex and flavorful, this would be my go-to Highlands whisky if not for my limited budget. very tasty sherry cask whisky!! !